suggests that the research places subjects or others at greater risk of harm - physical, psychological, economic or social harms - than was previously known or recognized. If the event is untoward and it happens during the study, its an AE. The IRB obviously doesn't want to know about every cold a child catches or every minor injury. It is interested in serious problems that are unexpected and therefore might affect the IRB's prior risk - benefit assessment. What else besides an AE could be an unanticipated problem? Change in the status of a subject that might affect their eligibility to remain in a study. The common feature of the events listed in the box on the right is that all potentially place subjects at risk of serious harm. Even when no actual harm occurs, if the event meets the definition of an unanticipated problem, it must be reported to the IRB. When the event goes beyond simply potential harm to where actual harm befalls a subject, then the event would be considered an adverse event. Adverse events make up the most frequently reported unanticipated problem reported to the IRB. Which Problems Require Prompt Reporting? Prompt reporting is required for all unanticipated problems which means those that are serious, unexpected and related to the research activity. This requirement for reporting unanticipated problems includes both CHOP-enrolled subjects and subjects enrolled at external sites. Sponsors and cooperative study groups frequently forward all SAE reports that take place during a multi-center trial, to all site investigators regardless of whether or not the event constitutes an unanticipated problem. Many of the reports relate to subjects who are not like those participating in the trial underway at the local site. The reports often come from trials for different disease indications or from subjects of different age groups with different pre-existing medical conditions. It is often impossible for an IRB to draw any conclusions from these reports as far as how they relate to the subjects in the trial that is going on at the local site. 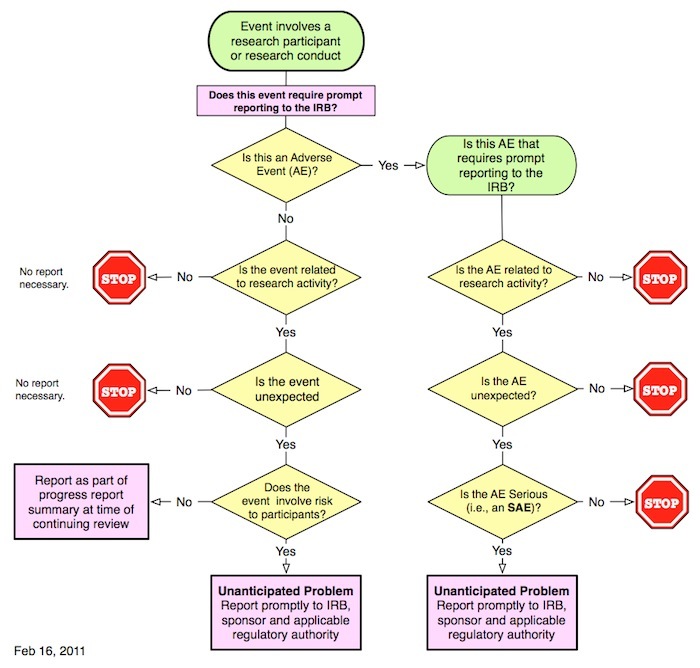 To help clarify which reports need to be forwarded to the IRB, the FDA has issued an extremely useful guidance document for investigators and IRBS entitled Adverse Event Reporting to IRBs — Improving Human Subject Protection . This guidance should be read by all those conducting FDA-regulated research and who receive SAE reports from sponsors. The guidance makes clear that only those reports that meet the definition of an unanticipated problem should be shared with the IRB; the investigator should store the rest in the study file. Minimizing the number of reports submitted to the IRB reduces wasted effort for both the investigators and the IRB and without increasing risk to participants. Which external SAE reports need to be reported promptly to the IRB? Sponsor's letters often state that the report should be filed with the IRB if required by local policy. The CHOP IRB prefers to review only those reports that meet (or at least might meet) all of the criteria for being an unanticipated problem. Investigators and study teams should store all other external reports in their study binders but need not forward these to the IRB. In the event the sponsor requires submission of the report to the IRB, this can be noted in the eIRB submission form and an acknowledgement will be sent automatically. a notification of current or former study participants. The IRB has issued a Memo outlining Procedures for Reporting External SAE Reports that provides a more detailed explanation. is a medically significant event that jeopardizes the subject's health. The Unanticipated Problems Decision Tree on the right is available as a pdf for viewing or download. All other unanticipated problems involving subjects external to CHOP must be reported within 7 business days of receipt of the report from the study sponsor, data coordinating center or overall study PI. Do I have to report all internal (occurred at CHOP) SAE's to the IRB? Only SAEs that are unexpected and related. For example, hospitalization of children with Sickle Cell Disease for painful crisis is expected as would be death after cardiac surgery. These events do not have to be reported promptly because they do not represent unanticipated problems involving risks to subjects. Well-written protocols anticipate and delineate the likely serious events and list the ones that will not be reported as SAEs. Do I have to report every external SAE report that the sponsor sends me? The IRB does not want to see most of these reports; only events that are serious, unexpected and related to the research activity need to be reported. A single event, by itself, is usually insufficient to make a judgment about change in possible risks to subjects. If in the investigator's judgment, the event was expected as a result of the subject's age, existing condition, other treatment administered or another factor, there is no need to report the event. The report must be maintained in the study file. What about the external SAE follow-up reports? The IRB does not want to receive follow-up reports that add no additional information about possible risks to subjects. Why do sponsors send all of these reports if they aren't of any benefit? Sponsors believe that they are complying with the regulatory requirements. They are unwilling to classify SAEs as unrelated to the study drug or other intervention even when there are other plausible and much more likely explanations. From the IRB's perspective, a report is only useful if the sponsor believes that the event is of sufficient significance to modify the protocol, the consent form or the Investigators Brochure. Less than 1% of the SAE reports received by the IRB result in a change to the research. As a result, the IRB has issued a Memo clarifying its requirements for external SAE reports. My sponsor requires that I send all of the SAE reports to the IRB; what do I do? If the sponsor requires that they be sent, the IRB's memo should be provided to explain CHOP's policy. If these reports are sent to the IRB, an acknowledgement will be issued without review by the SAE subcommittee. This is not a productive use of the investigator's or the IRB's time. Hopefully, the new FDA Guidance on Adverse Event Reporting to IRBs will diminish the frequency of these reports.